oil on canvas 45 x 55 cms. ANTON MAUVE - ANTON MAUVE jr.
Vincent van Gogh starts to draw and paint in Brussels. More of his own. Never the less, it was his start. 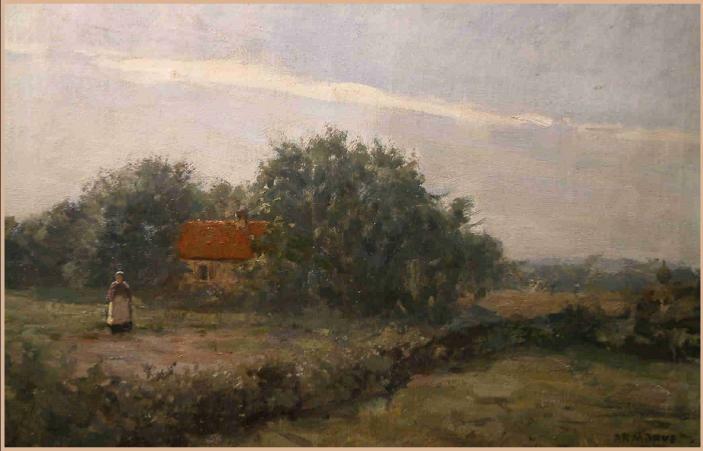 Later Vincent found in 1882 some encouragement from Anton Mauve (1838-88), his cousin by marriage. Mauve had established himself as a successful artist, and from his home in The Hague, supplied Vincent with his first set of watercolors, thus giving Vincent his initial introduction to working in colors. Vincent was a great admirer of Mauve's works and was deeply grateful for any instruction that Mauve was able to provide. .Vincent's relationship with Anton Mauve was a valuable one, though extremely turbulent as well. Vincent was incapable of accepting any form of criticism about his works and, to make matters worse, Mauve strongly disapproved of Vincent's relationship with the prostitute, Sien. Eventually Mauve would break off communications with Vincent altogether.
. After hard working Vincent made his masterpiece, The Potato Eaters. His Rembrandt. Mauve disliked that painting very much. Too dark, too sad. Even Mauve went to the father of Vincent and said to him it would be better Vincent stops painting. This situation was terribly for Vincent. May-be he never came over it.